French Antique Shop is a family owned business representing three generations of true antique connoisseurs. We take great pride in continuing the tradition established by our parents, Monsieur and Madame Granet, who devoted their lives to the appreciation of fine French antiques. The French Antique Shop, Inc. is currently operated by Henry Granet, Nicole Granet Friedlander, her son Marc Friedlander, and his son Michael Friedlander. 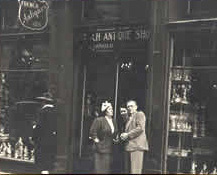 Marie and Marcel Granet opened their first shop in Paris when they married in 1927. They came to the United States before the outbreak of the Second World War in 1939 and were planning to re-establish their shop in Houston Texas. However, when they reached New Orleans, they fell in love with the Vieux Carre and decided to go no further. Their first shop here in New Orleans was located on Chartres Street in the French Quarter and was stocked originally with pieces they had brought with them from Paris. They eventually moved to Royal Street and settled in our present expanded location at 225 Royal Street in 1947. We remain a family business whose expertise in collecting and selling quality antiques is world renowned. We are indeed fortunate to have such an outstanding collection of authentic French and Continental pieces. Our stock offers a remarkable selection of splendid 18th and 19th century country and sophisticated furnishings, as well as an extensive display of marble mantels and gold leaf mirrors, bronze statues, and continental and Oriental porcelains. Featuring one of the most comprehensive collections of antique lighting in the United States, the ceilings of the French Antique Shop are ablaze with an exciting variety of chandeliers and hall lights. Our fixtures range from a magnificent six foot tall bronze d’ore chandelier draped with finely cut Baccarat crystal to simple country French iron lanterns. Many of the lighting fixtures were originally made for candles and have been converted to electricity by the craftsmen in our atalier (workshop). We continue to import all of our merchandise from Europe. We receive shipments several times a year, attracting customers from all regions of the United States and abroad who come to the French Antique Shop to furnish their interiors. Because of the public’s ever-increasing appreciation for fine antiques, these treasures are becoming increasingly scarce. We at the French Antique Shop offer our clients the rare opportunity of choosing from an unparalleled concentration of authentic 18th and 19th century antiques in our galleries, here in the heart of New Orleans’ famed French Quarter.